It is miserable for a farmer to be obliged to buy his seeds; to exchange seeds may, in some cases, be useful; but to buy them after the first year is disreputable. There is little doubt, if you have an interest in hobby farming, that you have heard lots of debate about GMO versus non-GMO and heirloom seeds versus hybrids and the virtues and evils of seed saving. I'm about to add to the discourse with my own educated opinion. Of course, I hope to persuade you all to my point of view, but even if I do not, I'm glad to have the opportunity to open the conversation. Honestly, for me, the bottom line on deciding whether to use seeds that have naturally evolved over time versus seeds that have had manipulation by science comes down to this: are you a home gardener or a commercial farmer? It is as plain and simple as that. GMO - Genetically Modified Organism - this is a plant or animal that has had a scientist alter the genes with DNA from other organisms to get specific traits. Examples of those traits can be resistance to disease or ability to tolerate pesticides. Non-GMO - this is a plant or animal that has not gone through the artificial genetic engineering process. Heirloom Seeds - These seeds are open-pollinated and will produce seeds that will grow plants with most of the characteristics of the parent plant. Hybrid Seeds - The plants are the purposeful cross pollination of two different parent plants from the same species. The seed produced will not be the same as the parent plant but a plant with different characteristics than the parents. However, when that plant creates seeds, the plant that will grow from them will likely revert back to the original parent type. The resulting seed with not produce the same plant in the second generation. Seed Saving - saving the seeds produced by a plant with the intention of growing the plant again from year to year. So, George Washington expected farmers to save seed from year to year. Of course, farms were smaller then and did not have scientists genetically engineering seed. It is hard to know what he would say today. I certainly think he would want to still be able to save his own seed and not be tied to purchasing seed every single year. Large commercial farms rely on GMO and Hybrid seeds because of the need to maximize their production and income per acre. Seeds that will produce more output on less acreage and that produce plants that are more disease resistant and able to be transported over long distances makes some sense on a very large scale. But for the home gardener, it does not make sense to rely on a corporation to provide our seeds from year to year. We do not require extremely large production from our plants and the food does not have to survive being transported miles and miles away before we eat it. Taste and Nutrition: We all know that a tomato straight from your own garden is far superior to the one that you get at the supermarket that is hard as a rock and been transported from a long way away. 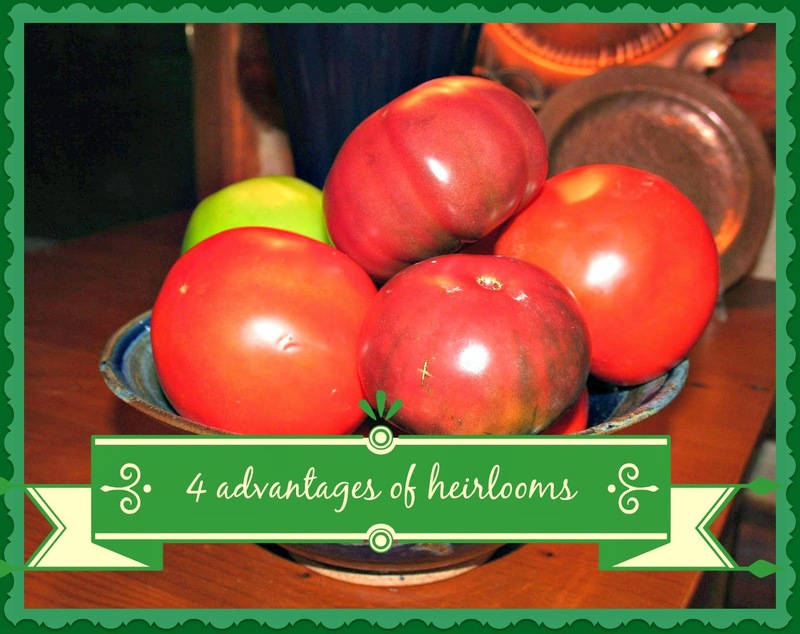 The heirloom varieties often have a better level of nutrition specifically because they are not engineered to produce more vegetables than the plant and soil can support. Mass produced vegetables have been shown to have lower levels of vitamins than home grown ones. Genetic Diversity and Large Selection: Plants grown from heirloom varieties have naturally developed to thrive in the specifics to that garden area. Since seeds are only saved from the most healthy plants, the good traits are passed to each generation of seed. The plants naturally adapt to the climate, pests in the area and diseases that may be in the area too which will result in a higher level of gardening success. There are thousands of varieties of heirloom seeds to choose from versus only a few of the scientifically engineered ones. Ability to Save and Trade Seeds: Growing heirloom seeds saves a lot of money! Because you can save the seeds from year to year, you do not need to go purchase seeds every single year. Trading seeds with others is absolutely fun - a gardening version of trading baseball cards. Connection to the Past: Wouldn't it be so fun to tell your guests at the next barbecue that the tomatoes in the salad were grown from seeds called Radiator Charlie's Mortgage Lifter that was first grown in the 1930's? Or maybe Cherokee Purple which dates back at least as far as 1890. Maybe you even have seeds that tell a story, like the tomato named Emmy after the young woman who fled Romania after WWII with a tomato in her pocket. Preserving our gardening heritage is an honorable pastime. I hope that you consider an heirloom plant or two this year in your garden. There are not only vegetables available but also flowers and fruits too! Two of my favorite catalogs to get me started are: Seed Savers Exchange and Baker Creek Heirloom Seeds. You can purchase this year but then save seeds at the end of the season for next year. Some communities have started seed libraries where you can check out seeds, grow them, save the seeds and return them to the library. Now that is one great way to serve a community! I'm doing some research with The Seed Library Social Network to learn how to start this in my own community. I hope I've planted an heirloom seed into your thoughts today that will grow and blossom. I'm truly looking forward to sharing 2015 with you as we learn together. Thank you for joining me today. Tomorrow, I'll share with you a different kind of library - the Little Free Library and the great work that organization is doing. I hope to see you then. Thank you The Graphics Fairy for the vintage cat images. Over on Estle Schipp Farm, we have several barn cats - eight at last count and all males. You would think that there would be a constant struggle to be King of the Barn and yet there is not. They are a tight knit group that are frequently seen snuggling together in the corner of the porch. In our first year of rural living, we had so much to learn. For example, we did not know that mice love to chew the coating on wires. During our first full winter here, we discovered that mice had chewed all the wires out of the lawn mower. This is the same mower that cost several thousand more dollars than my first car (it is true that my first car was a used Chevy Vega...but still). This was going to be an expensive fix. We needed a prevention plan. We gathered information from our neighbors and received various pieces of advice ranging from Irish Spring soap inside the mower, to mothballs to poison. We never tried the mothballs after another neighbor said it wouldn't work. We did try the soap; the mice ate it too along with the wires. So, we tried poison. Unfortunately, we had a curious border collie who got in the poison and after a stint in doggie intensive care and a year long regimen of Vitamin K, we had spent even more money than the original fixing of the mower. So future use of poison was definitely OUT! That lead us to get our first pair of barn cats and I'm so glad we did. Not only have we had no more mice troubles in the barn and only rarely in the house but we also have the joy of watching their feline antics during the day. LK is the watcher...as in, if you do not get out and feed them by 8:00am, he will move from window to window watching you until you get out there. LK is the one that will jump up in your lap when you take a quiet break in the porch rocker. One-eyed Black-Jack - He was gone for awhile and when he came back, he was missing an eye. Trust me, it does not affect him. He is the best hunter ever! Grumpy - He is all white with grey ears and grey tail and if any other cat gets to the feed bin before him, he loudly complains for a very long time. Tiger - You will find him most days, partially crouched in the grass as if he were hunting something nearly every moment. Either that or he is posing for a potential photo op. There are four black and white cats that are nearly identical. Three of them get called Little Mister since I cannot tell them apart. They have no tails and a little extra toe on their paws. One does have a pencil thin mustache over his upper lip so I call him Rico Suave. He walks about a half step right in front of you but when you reach down to pet him, he scampers away. Our cats spend their days hunting and playing and lounging in the sun on pretty days or curled up in the corner of the barn on colder days. We are completely happy with the rodent control method we can chosen - it is effective and not adding poison to our homestead. Tomorrow is gardening day and I will review the difference between heirloom seeds and hybrids and let you know which will make up my 2015 garden. I hope to see you then. Thank you, TheGraphicsFairy.com for the vintage image. 100 million trees are needed to produce the annual supply of bulk mail - that's the equivalent of deforesting the entire Rocky Mountain National Park every four months. I absolutely love getting mail. Every single visit to the mailbox makes me happy - and then I sort through and see that the majority of it is bulk mail - sometimes called junk mail. 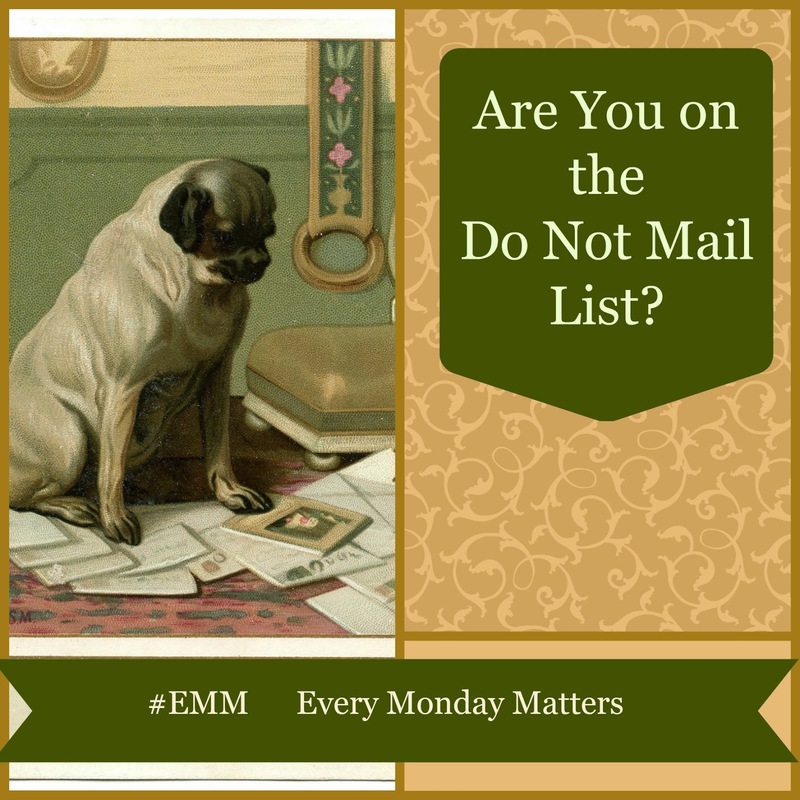 In fact, in Every Monday Matters, the authors estimate that, on average, everyone gets 1.5 pieces of personal mail per week compared to about 10.8 pieces of junk mail. Almost half of that mail never gets opened and goes right into the trash. Every Monday Matters authors, Emerzian and Bozza, state that 5.6 million tons of this mail ends up in our landfills annually. Time to start putting those discarded pieces in the recycle bin! Did you know that there is a National Do Not Mail List? You can complete the form on the website in less than 5 minutes. I completed mine right before I wrote this post. You enter your information and then are directed to a page where you can opt out of all special offers or select the categories you do or do not wish to receive. I'm sure it will take several weeks for the request to take effect - I don't see that information on the website . I do think that requesting to be left off these bulk mailing list is worth the effort. I'm glad that I made a decision to Be Intentional to decrease these mailings. I want to stop my contribution to the destruction of trees for the paper and my contribution to the landfill space to deal with the waste. In the meantime, put the junk mail you do receive to good use! I did a Pinterest search for Junk Mail Crafts and got a LOT of hits. Everything from recycling the paper to make notepads to homemade paper to gift card holders to jewelry! So let's get out to that mailbox and Make Monday Matter - I would love to hear if you get a lot of junk mail and turn it into useful treasures...drop me a comment and let me know! One simple roast chicken is a classic and comforting dish that I think everyone should know how to cook. In fact, it is one of the 'must learn before leaving home' dishes I will insist my sons perfect before they move out. There are a few other 'must learns' but this one is the one that tops my list. 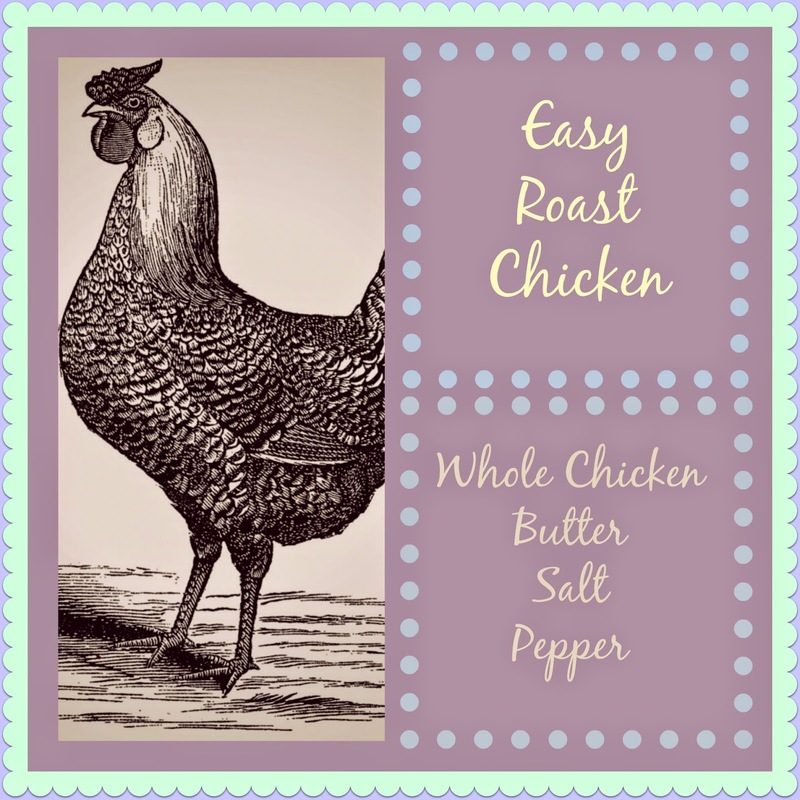 Roast chicken can be simple or fancy but most assuredly will provide more than one night of suppers. You will have the roast bird one night, leftovers on another and then turn the carcass into a lovely broth for a soup meal on yet another night. It is one of the few meals that pleases everyone in my home whenever it is served. I love how my husband's face totally lights up when I tell him it is ready for carving. He sneaks quite a few bites during the process LOL. Here is the very basic recipe. Sometimes I change it up and use herbs, garlic, lemon or orange depending upon what I have in the pantry. Often, I use just this basic one. Unwrap the chicken from the wrapping and remove the neck and giblets from the inside. Rub the softened butter all over the chicken inside and out. Salt and pepper the chicken all over inside and out. Place the chicken in the pan or cast iron skillet. Put in the 425 degree oven and roast for 15 minutes. Leave the chicken in the oven and turn the temperature down to 375 degrees F.
Let roast for about 1 hour more or until the temperature in the thigh reaches 165 degrees F. I do recommend having a meat thermometer to check since chicken must absolutely be cooked thoroughly. Remove the chicken from the oven when done and place on your cutting surface - but do not start carving yet! Let the chicken rest for about 15 minutes to allow the juices to redistribute. Tomorrow is our day to #BeIntentional and Make Every Monday Matter where we are in week 6. Hope to see you then! This post may contain affiliate links which means if you make a purchase using one of those links, I will receive compensation at no extra cost to you. 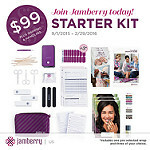 It is a great way to support your favorite blogger! Thanks TheGraphicsFairy.com for the image. Scarves, mittens and hats are a great way to express your personality in the cold weather. Are you at risk of losing power due to a natural disaster like a winter storm? We certainly are here in Indiana. Do you have a plan to stay warm and avoid a serious condition like hypothermia? If you do, I'm really proud of you. :) If you do not, get prepared today! 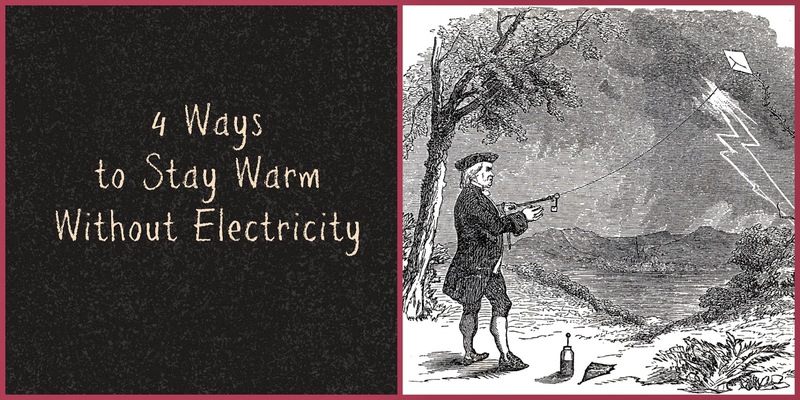 I'm reading The Weekend Homesteader: A Twelve-Month Guide to Self-Sufficiency by Anna Hess and one of the December entries is on how to stay warm without electricity. Hess points out that a winter power outage can have serious consequences to your health and well-being if you have not laid out a plan before it occurs. Note that hypothermia can occur even if indoors in lower temperatures. *Note that I am not a physician and do not give medical advice. Please seek advice of your own medical professional on this issue. Please seek medical attention for anyone with symptoms of hypothermia! Make plans now to lessen your risk of this dangerous condition by planning how you will keep your family warm during a power outage. So much better to be prepared than to risk a medical emergency when emergency rooms and hospitals may be overwhelmed. Here are four ways that Anna Hess recommends to have in place before a winter storm knocks out power and your heat supply. She outlines ways to heat a room but emphasizes more heating your body instead. Propane or Kerosene heaters are another option but *MUST* be well ventilated to avoid carbon monoxide which will kill you. I must say that this is not one of my favorite options because the odors do not sit well with me. If you will be sleeping alone, opt for the mummy style bags. If you have a cuddle buddy, zip two regular sleeping bags together for extra warmth. You don't have to wait for a power outage to use them! Put them on your bed now and turn down the thermostat to save some money. Moving around causes your body temperature to rise, so get up and do things regularly. If you start to sweat from wearing layers of clothing, remove some layers until you are comfortable. Do not allow yourself to wear wet clothing. Warm food and drinks help so have a plan for cooking too. Do not use alcohol thinking it will warm you up. Alcohol does not raise the core body temperature and it can dull your senses to knowing when you are getting too cold. Please use caution when wearing layers of clothing and warming up food and drinks. Some of the synthetic fibers used in clothing today are quite flammable. So that is the skill I've been working on today. I have a room I can close off and we have the right clothing. I do need to invest in better sleeping bags though so I'll be looking for some deals on those. We have an indoor dog so she would be joining us in our makeshift one room cabin. If you have other animals that may be really cold sensitive, like birds, rabbits or guinea pigs - be sure to include a place for them in your plans too. Tomorrow is our Sunday Cooking post and I'll be discussing how to roast a whole chicken. Really easy to do and will feed your family a meal, plus some leftovers and then a carcass to make soup. Click here for a link to the image from The Graphics Fairy - Thanks! "Anyone who thinks gardening begins in the spring and ends in the fall is missing the best part of the whole year; for gardening begins in January with the dream." We made it to the Twelve Days of Christmas! I do enjoy the season of Advent but also find it quite stressful with all the activity and preparations - but now, the days between Christmas Day to the Epiphany are my most cherished of all when we come to recognize the newborn Christ as King. I'm sending prayers for everyone who visits this blog for continued blessings throughout the rest of the Season. Thank you for stopping by today! On Christmas Eve, I received my packets from WinterSown.org from the request I made to grow produce for our local food bank. I received several seeds packs to get planted by the #Wintersown method over the next few weeks. I'm quite pleased with the variety I received and doubly pleased that many of the seeds are from donations that other gardeners wanted to share. I am trying to stay with open-pollinated varieties and heirlooms when I can. There is so much value in the plants that are able to adapt and pass those traits onto their offspring without the interference of large companies manipulating the product. I'll be letting a plant of two of each variety go to see so I can donate seeds back to Wintersown to keep this great program going. My garden plan for 2015 is to provide for my family and friends, of cours. I am also going to follow the Plant a Row For the Hungry Program so I can provide fresh vegetables to our local food pantry. 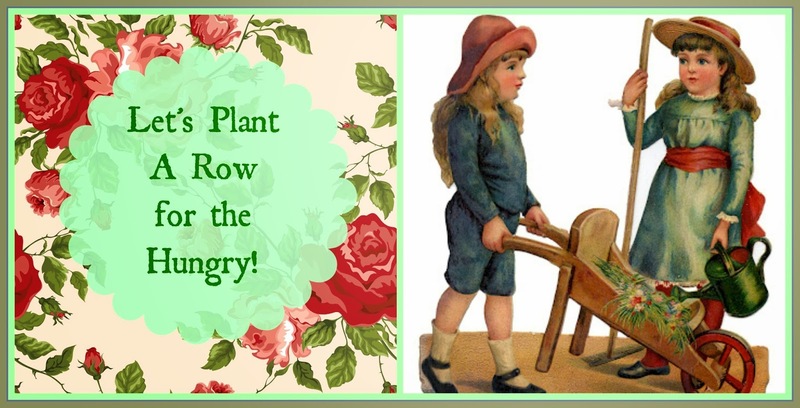 The Plant a Row for the Hungry Program asks gardeners to plant just a little extra with the intention of donating the produce to a food bank, food pantry or soup kitchen in your local area. The program was started in Alaska by Jeff Lowenfels who asked readers of his garden column to plant a row of vegetables for a soup kitchen in Anchorage. The program was wildly successful and the spread nationwide. In the first five years of the campaign, one million pounds of produce was donated. Within two more years, it was another million donated. To date, it is estimated that over twenty million pounds of produce has been provided by gardeners in America to help feed the hungry. With each pound of produce providing up to four servings, 80 million meals have had the benefit of fresh vegetables added to provide nutrition to our most vulnerable populations. I'm so looking forward to the garden season to come and I hope you are too. Let me know if you decide to #PlantARowForTheHungry, I would love to hear about it! This post may contain affiliate links, which means I receive compensation if you make a purchase using those links. "Whether you have an apartment balcony or a 20 acre farm, you can create a garden that attracts beautiful wildlife and helps restore habitat in commercial and residential areas." To date, there are 174,894 habitats that welcome wildlife by providing food, water and cover in order to be certified by the National Wildlife Federation (NWF). According to the NWF, habitat loss is the largest threat to the health, well-being and survival of the native wildlife in the United States. Habitat destruction: Clear cutting of trees, bulldozing areas for future building, turning meadows into housing developments and filling in wetlands all contribute to the destruction. Habitat fragmentation: Even when a portion of a natural habitat is kept intact, the connections to other natural areas are now broken up and not connected due to roads and development. The fragments that remain may not be large enough to support food needs and space needs for reproduction. Habitat degradation: This encompasses pollution and invasive species. Invasive species can choke out the native plants that support native wildlife. Step 1: Provide Food for Wildlife--Aim for at least three of these food sources either in the form of plants or feeders. Step 2: Provide Water for Wildlife--Aim for at least one of these water sources. Step 3: Provide safe Cover as shelter from the weather and safety from predators--Aim for at least two areas of shelter. Step 4: Provide a safe place for wildlife to raise their babies. Some of these areas will be the same as providing safe cover. But, sometimes specific wildlife need specific host plants to rear the young. Aim for at least two places for wildlife to mate, gestate and raise the young. Step 5: Garden in a sustainable way--Aim for at least two of these garden practices. 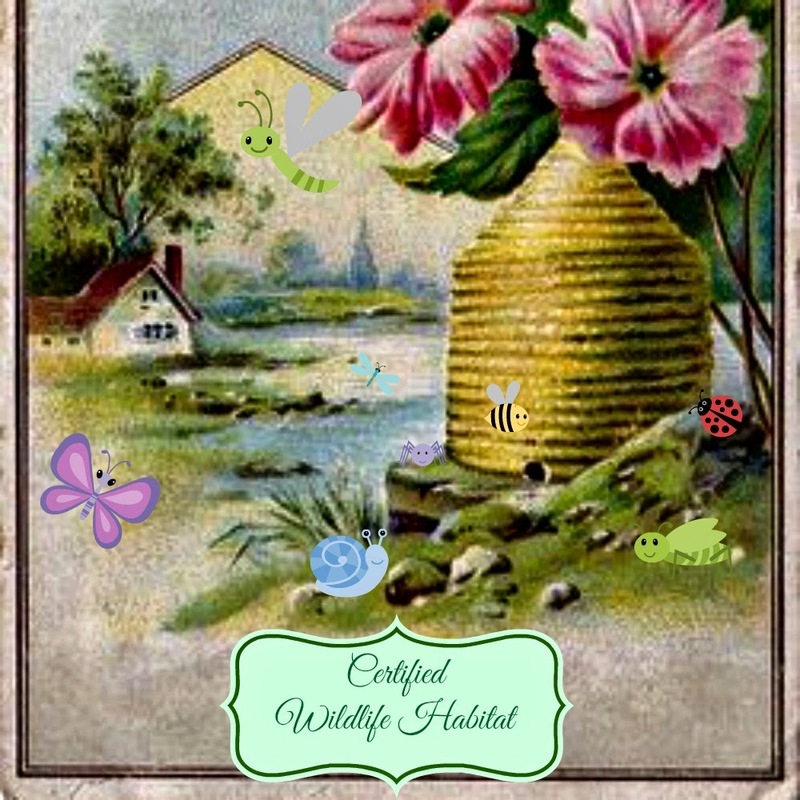 I'm in process of getting my habitat ready for certification and I do hope you will consider making these changes even if you do not "officially" become certified. The joy I get when I get a glimpse into the natural world and the wildlife in it is the best therapy in the world -- not to mention sharing those unplanned moments with those you love. This year, our whole family stood absolutely still to watch a mama owl feeding her young--it was a rare moment and one I will always cherish. Will you set up a wildlife friendly environment at your own home? Please let me know in the comments. Tomorrow is Wednesday and the day we spend in the garden. I will share with you the seeds I received from Wintersown.org and discuss the plans I have to Plant a Row for the Hungry, Hope to see you then. Thanks Graphics Fairy for the vintage image of the bridge. If you have been reading Monday posts, you will remember that I set this day aside to Be Intentional and make the day matter. This week, we are in week 5 of our reading of: Every Monday Matters along with Charging the Human Battery, both books certainly give us so much to consider. The task this week to make #EMM (Every Monday Matter) is focused on healthy eating. I have always struggled with this - I truly love to eat fruits and vegetables but my family does not. So, I usually end up making more than one meal at a time and, frankly, sometimes it takes more effort than I can muster after working. So, my focus in the next few weeks is to Be Intentional and find vegetables recipes that my family will eat. As I've said in other posts, I'm willing to be sneaky about it. Do you have any tips to give me? I would love to see them in comments. Let's focus on the quote though. 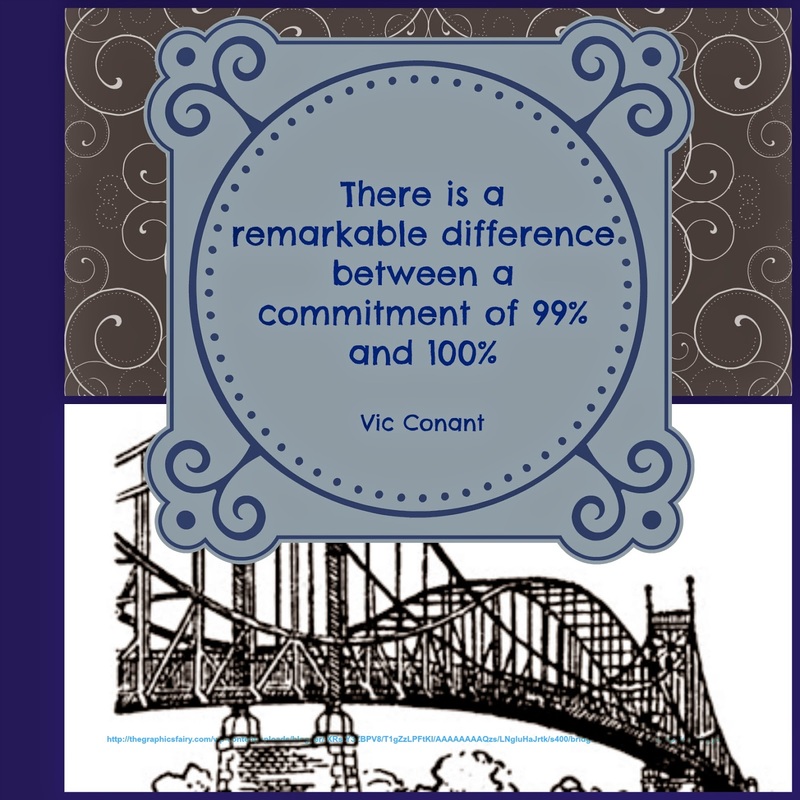 There is a remarkable difference between a commitment of 99% and 100% as Vic Conant is quoted in Charging the Human Battery. I mean, isn't 99% good enough? Depends on what the topic is, doesn't it...I mean a score of 99% on a calculus test is pretty good I would say. What if your nurse says he or she is 99% certain the medication being given is correct? The computer chip that is saving the precious pictures of a special event keeps 99 of them but loses 1. The bridge spans 99% of the river but falls 1% short of the bank on the other side. I know that I can sometimes discount the value of being 100% committed to a goal - thinking that expending almost enough effort to succeed will suffice. Too frequently, thinking that way leaves me disappointed with my results and discounts the effort that was expended. I'm starting to form my goals for 2015 and I think this one is certainly a contender - to commit 100% to whatever I do. I'm all in....are you? I would love to here your thoughts on this topic in the comments! I've been reading the blog of Frugal Hausfrau and found her post on creating your own casseroles. So, just like last week when I posted about creating your own soup recipes, I wanted to share making your own casseroles too. There is no need to open another box dinner to get a quick, one-pot meal on your table in a short amount of time. 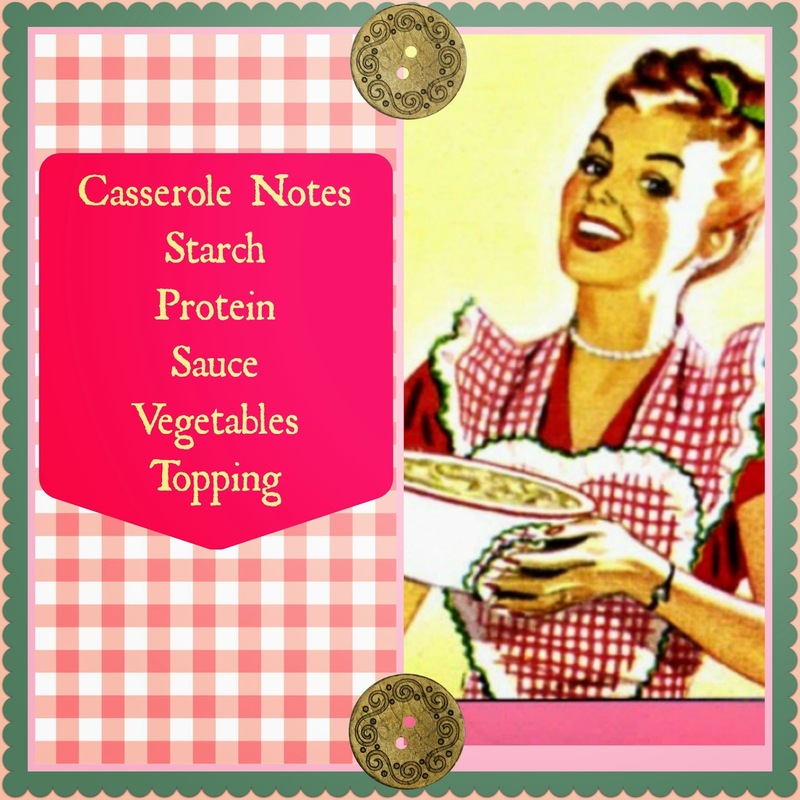 Casseroles are comfort foods and a good way to sneak some protein or vegetables into the diet of your family--that is, if you need to get sneaky about that sort of thing like I do...LOL. Casseroles are a great way to re-work dinner leftovers into a completely different meal too! Think about flavors that you like together - maybe enchiladas, or pot roast, or chicken cordon bleu - now deconstruct the ingredients in your mind and think of how you can reassemble them to have similar flavor as your favorites but in a casserole. Generally, I layer the ingredients in a greased casserole dish and bake for around 30 minutes at 350 degrees F. Toppings will get added toward the end of the baking time. One of the challenges I hear about casseroles is the use of canned soup which is so high in sodium. I urge you to try making your own White Sauce like is posted over on Allrecipes. You can add shredded cheese to that recipe too to make cheese sauce. Look over recipes on the internet to get an idea of the ways others put casseroles together - but use them as guidelines only! Making the recipe your own with what you have on hand is what will fuel your creativity plus be economical. The casserole dish can be anything that can go in the oven safely and be easily cleaned after, I really like enameled cast iron like this one by Lodge. They last forever and can be passed down from generation to generation. My favorite casseroles range from a pizza casserole with Italian sausage, tomatoes, rotini and lots of mozzarella to a creamy ham and noodle casserole with a lovely cheese sauce. Today, it was a chicken and rice casserole with carrots and peas topped with buttered bread crumbs. Tomorrow is Be Intentional and Make Monday Matter - Week 5. Hope to see you then! This post contains affiliate links, which means I receive compensation if you make a purchase using those links. 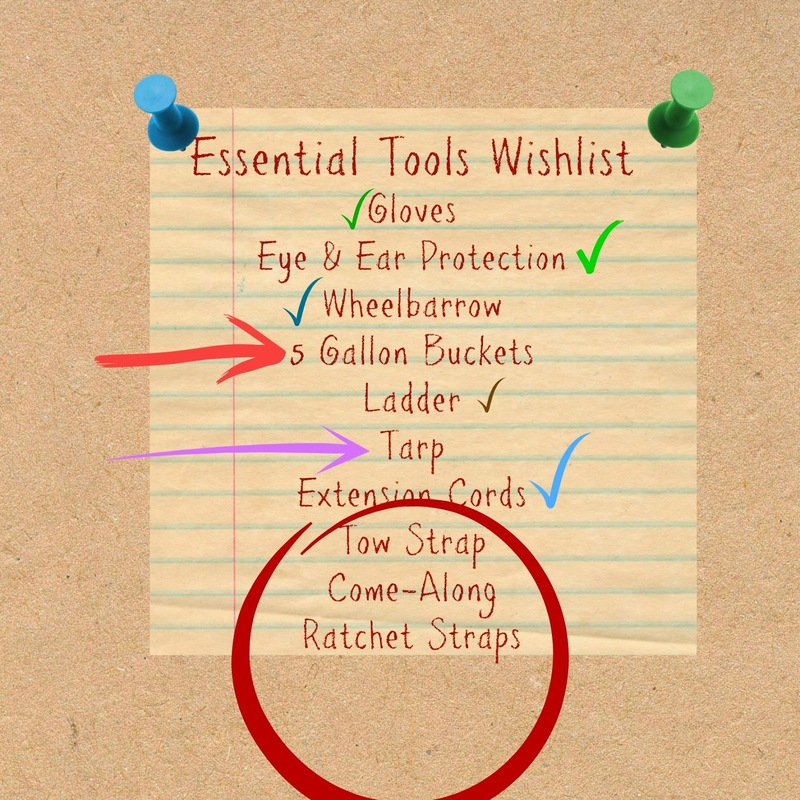 I've been reading The Weekend Homesteader: A Twelve-Month Guide to Self-Sufficiency by Anna Hess and was glad to find one of the sections for December to be on the topic of tools - which ones you need and what to look for. Experiences on Estle Schipp Farm have taught me to have the right tools, at the right time, to do the job right. When I do not have the right tool, I will always do one of two things....either I will impulsively buy a tool and spend too much money or I will try to make do with what I have and make the task even more difficult than it needs to be. The chapter has sections for basic tools, garden tools, cooking and preservation tools and building/demolition tools. Today, I will focus on basic tools. Here is the list plus some information on each. Eye and Ear Protection - Your vision and hearing are too important to risk using tools without proper protection - Please use it - no excuses. Wheelbarrow - or wagon - You can carry vastly more weight if you use a wheelbarrow or wagon - save your back and let physics do more of the work for you. You will use this much more than you expect - whether it is hauling mulch to the garden, firewood to the stacking area, weeds to the compost pile or feed to the chicken coop. Five Gallon Buckets - You need *at least* a dozen and more if you can get them - you will use them for so many things. Turn the upside down and you have a quick spot to sit while picking raspberries or to sit by the campfire. Right side up and you will use them to tote water to your animals, manure for composting, or filled with your beekeeping supplies. Later this year, I'll be using some of mine to collect sap for maple syrup. Note: You can obtain these buckets for free or nearly free from groceries, bakeries and restaurants. Ladder - you will not likely use this tool on a daily or even weekly basis, but when you need one, nothing else will safely do. Please note that ladders used in an unsafe manner are highly likely to cause a very nasty fall. Always - and I mean every time - use a second person to steady the ladder. Tarp - oh the many things a tarp can do! It can be thrown over anything that needs to be kept dry. It can serve like a blanket to toss chicken bedding onto and then drag to the compost when you are ready to discard. It can be a tent or an impromptu form of shade too. Have several on hand. Extension Cords - over at Estle Schipp Farm, it is a rare event that the place where we need to do work with power tools will be near an outlet. Since work will need done nearly anywhere on your property, have several heavy duty extension cords that can be used outdoors. Tow Strap - I have to confess that I did not think we would need one of these - but we have needed them - once when a sister's car slid off into the ditch along the side of the road in front of our house, once when our truck slide off the drive into a mud bog, and once when our neighbors tractor rolled over into our swamp....so don't get stuck without a tow strap available! Tow trucks are few and far between out in the sticks. Come Along - before we moved out to the country, I had no idea what this tool was. Sometimes they are called a hand winch and they are mighty handy if there isn't another vehicle around when your own car is stuck or when you need to move a fallen tree - especially one blocking your driveway. Ratchet Straps - If you want to be sure that something you need to haul around on the farm - or to the farm - or away from the farm- will stay secure in the back of the truck, use ratchet straps. They fasten down quite securely and you won't have to worry so much about your knot tying skills on pieces of rope. Thanks for joining today and, as always, I appreciate comments so please let me know another essential tool you want to add to the list. Tomorrow is Sunday Cooking....last week I listed my Soup Notes and this week will be my Casserole Notes. Hope to see you then.